To find the detailed building blocks of life in the cosmos, a new, third-generation instrument will be placed on NASA’s SOFIA – the airliner-based Stratospheric Observatory for Infrared Astronomy. Professor Gordon Stacey will lead a Cornell team of researchers and students to develop the cryogenic scanning Fabry-Perot interferometers, a key tool for detecting distant molecules. The team will develop and build the interferometers to be part of the High Resolution Mid-InfrarEd Spectrometer, or HIRMES. This instrument will detect neutral atomic oxygen, water, hydrogen and deuterated (heavy) hydrogen molecules at infrared wavelengths between 28 and 112 microns – one-millionth of a meter. Detecting these wavelengths is key to learning how water vapor, ice and oxygen combine with dust to form planets, according to NASA. First light for HIRMES aboard SOFIA is slated for spring 2019. “These very high spectral-resolution Fabry-Perot interferometers are one of the two key technological challenges for the successful operation of HIRMES on SOFIA,” said Stacey, professor of astronomy. The interferometers are the devices that achieve the resolving power necessary for HIRMES to reveal the process of collecting the raw materials that are the building blocks of life from interstellar clouds and collapsing them into planetary systems, he said. The other technological challenge is developing the sensitive bolometers – the detectors that measure radiant energy – which is being done by NASA’s Goddard Space Flight Center in Greenbelt, Maryland. 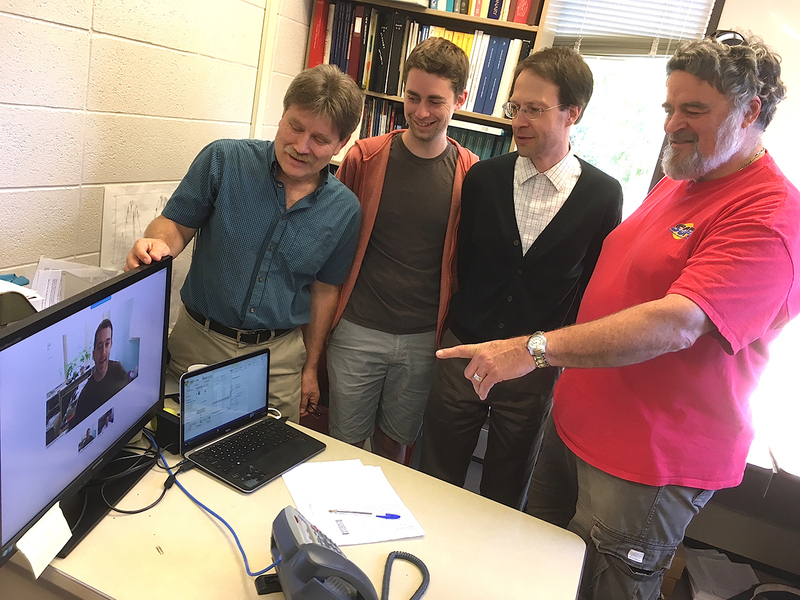 The other Cornell team members are research associate Thomas Nikola; research support specialists Steve Parshley and George Gull; visiting scientist German Cortes; and Nicholas Cothard, a graduate student in the field of applied and engineering physics. Engineering undergraduate Keith Works ‘19 has begun the first designs for spectral filters to be used in HIRMES. Stacey and his team will deliver three high-resolution and mid-resolution versions of the interferometers, and two versions that are designed to image nearby galaxies. A member of the science team for HIRMES, Stacey is also the lead scientist on the nearby galaxy investigations. The largest airborne observatory in the world, SOFIA – a short-body Boeing 747SP – flies above most the obscuring water vapor in the Earth’s atmosphere and can make observations that are impossible for even the largest and highest ground-based telescopes. In historical context, Pan American World Airways originally acquired the Boeing 747 jetliner in May 1977, according to NASA. Pan Am named the aircraft Clipper Lindbergh to honor famed aviator Charles Lindbergh, when his widow, Anne Morrow Lindbergh, christened the aircraft May 6, 1977 – the 50th anniversary of Lindbergh’s flight from New York to Paris. Currently, SOFIA’s instruments – cameras, spectrometers, and photometers — operate in the near-, mid- and far-infrared wavelengths to examine star birth and death, solar system formation, identifying complex molecules in space, galactic black holes, and planets, comets and asteroids in our own solar system. NASA’s Samuel Harvey Moseley will lead the HIRMES team. Other participating institutions and agencies are Space Dynamics Lab, Precision Cryogenic Systems Inc., University of Michigan, University of Maryland, Smithsonian Astrophysical Observatory, Johns Hopkins University, Space Telescope Science Institute and the University of Rochester.